Every Wednesday home game will henceforth be designated as a guys' night out at EnergySolutions Arena. The air will be choked with the scent of testosterone and pizza, and the sounds of fist-bumps and towel-snaps will reverberate throughout the arena. Sports-hatin' girlfriends and wives (is there any other kind?) can stay home and have a Scentsy party, bake, eat salad, wash their hair—you know, the stuff women daydream about doing when they've been dragged to yet another sporting event with their partners, who would probably rather be high-fiving each other anyway. It is a pretty good deal; buying four $18 tickets gets you four pizzas, since guys love pizza as much as they love beer, sports, scratching themselves, and whatever else Tim Allen has made his millions on. But there are still some unanswered questions here: Where are the seats? Are they nosebleeds? Is this just a ploy to turn the upper deck into a man pile? And, if this follows nightclub tradition, in which "ladies' nights" end up attracting the skeeziest dudes, won't this deal simply attract a bunch of chicks—exactly what the ESA apparently doesn't want to see on a Wednesday? Baris Otuzsekiz has yet another question, on the Jazz's Facebook page: "What guys'night out mean' s ?" Luckily, Jose Carlos Lazalde was there to answer: "Guys' night out means leave your girlfriend at home and go out with your guy friends." But the real question here is: WHY is this package a guys' night out? The Salt Lake Bees (ladies: they play baseball, a sport that is way more boring than basketball) has theme nights, but none are gender-specific (the deals aren't advertised on their site, but to my recollection, they have family nights that come with free hotdogs, cheap beer nights, buy-one-ticket-get-one-free nights, etc.). And as much as I love washing my hair and eating salad, I also love the Jazz (and pizza). I won't go into my Jazz history to cheesily prove that to you, since the only thing rivaling the lameness of the cliches about guys and sports are the desperate anecdotes women tell guys to prove that they love sports JUST AS MUCH as anyone else ("I asked for a baseball mitt instead of a doll for my 8th birthday!" "When I was still a fetus, my father took me to meet John Stockton at a mall event!"). I'm not ready to go protest in front of EnergySolutions or anything, but this deal, which was promoted on my Facebook feed today, does press a few of my Offended buttons. 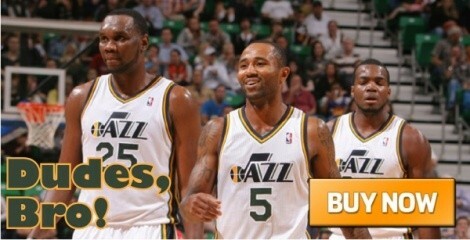 Can't the Jazz boost attendance without alienating 50 percent of their potential ticket buyers?